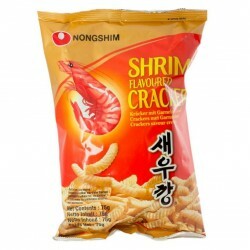 Shrimp Crackers are shaped like crunchy French fries with narrow ripples. They are "hot, salted and fried" and are made from fresh flour and ground shrimp. You will enjoy the fresh scent of the ocean and the delicious taste of this product. Wheat Flour, Rice Bran Oil, Wheat Starch, Ground Shrimp (8.1%), Palm Oil, Sugar, Salt, Dextrin, Yeast Extract, Mushroom Extract, Kelp Extract, Anchovy Extract, Hydrolysed Soy Protein, Cream.